Anastasia R. Snyder is an Associate Professor of Human Development and Family Studies in the Department of Human Sciences. She also an affiliate of the Institute for Population Research, at The Ohio State University and has an OSU Extension appointment in Family and Consumer Sciences. She studies family change and the transition to adulthood, with a focus on rural populations. Snyder teaches two graduate courses—Family Demography and Secondary Data Analysis. She also teaches Research Methods and Life Course Studies at the undergraduate level. 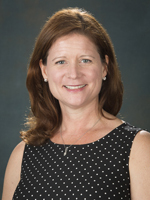 Snyder has served her college and department in a number of administrative roles, including Interim Chair of the departments of HDFS and Human Sciences, Program Leader for HDFS in Human Sciences, and Associate Chair for Research in Human Sciences. Snyder has two main areas of research, one focused on family change and well-being, and the other on emerging adults and the transition to adulthood. Her family research examines changes in family formation and dissolution patterns in the United States, with an emphasis on rural families. She also studies family economic well-being among families with children and has focused on poverty, public assistance usage and food security. Her research on emerging adults examines the transition to adulthood in the United States, with an emphasis on how residential change and migration are associated with other key life events, such as family formation, leaving the parental home and educational attainment. This area of research also has some focus on rural/urban and regional variability in these processes. All of her research takes a demographic perspective and uses large secondary data sets such as the National Longitudinal Studies of Youth, U.S. Census and Current Population Survey, occasionally in combination with primary data collection projects. She recently finished a project that studied food security among a national sample of low-income families with children, and has ongoing research studying family formation patterns among emerging adults, and changes in family formation and dissolution among rural families. She is currently working on projects that will study how the shale oil and gas boom has impacted families and communities in rural areas across the nation, and how physical and mental health impacts food insecurity in families with children. Snyder also has an extension appointment in the Family and Consumer Sciences area and in this role she works with extension educators throughout Ohio in developing community education programs that improve the lives of families and children. This work currently focuses on co-parenting programs and developing a new program to help individuals and families in Ohio better address the needs of our aging population. Jang, B. & Snyder, A. (2015). Moving and union formation in the transition to adulthood in the United States. Advances in Life Course Research. Vol 23, p. 44-55. Bonomi, A.E., Nemeth, J., Altenburger, L.E., Dotto, I., Anderson, M.L., Snyder, A.R., & Dotto, I. (2014). Fact or Fiction? Fifty Shades is Associated with Health Risks in Adolescent and Young Adult Women. Journal of Women’s Health, 23(9): 720-728. Jang, B, Casterline, J, & Snyder, A.R. (2014). Migration and Marriage: Modeling the Joint Process. Demographic Research, 30, 1339-1366. Snyder, A. (2011). "Patterns of Family Formation and Dissolution in Rural America and Implications for Well-Being." In, Smith, K. (ed) Economic Restructuring in Rural America, Penn State Press Rural Studies Series. Demi, M.A., Coleman-Jensen, A. and Snyder, A.R. (2010). “The Rural Context and Secondary School Enrollment: An Ecological Systems Approach.” Journal of Research in Rural Education, 25 (7), 1-26. Demi, M.A, McLaughlin, D.K. and Snyder, A.R. (2009). “Rural Youth Residential Preferences: Understanding the Youth Development-Community Development Nexus” Community Development, 40 (4), 311-330. Snyder, A. R., McLaughlin, D. K., and Findeis, J. (2006). “Household Composition and Poverty among Female-Headed Households with Children: Differences by Race and Residence." Rural Sociology,71 (4), 597-624. Snyder, A.R. (2006). The Role of Contemporary Family Behaviors in Nonmarital Conception Outcomes of Nonmetro Women: Comments on Albrecht and Albrecht (2004). Rural Sociology, 71 (2) 155-163.